Flexible resource use, including human use of a range of local resources, many of which are linked in a food web with salmon, likely contributed to resilience. 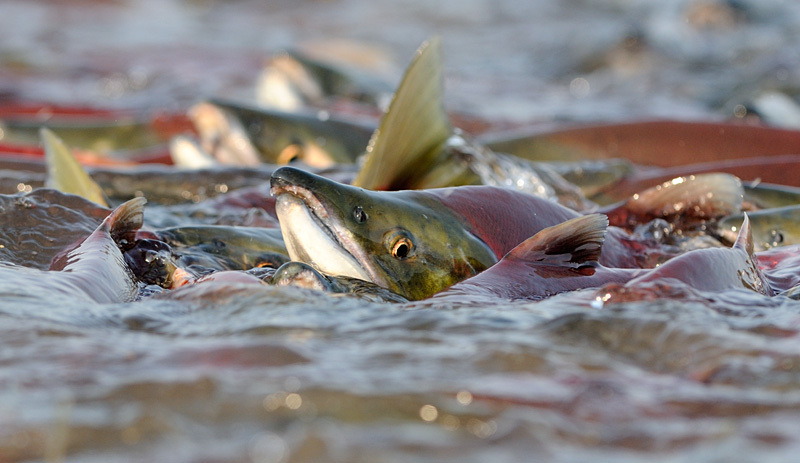 Most important were the beliefs and social institutions (including ownership, regulation, rituals, and monitoring) that placed restraints on salmon use as a common pool resource. In contrast, only a small fraction of our modern society relies economically on or has direct interaction with the fish, which limits our concern and willingness to fundamentally change behaviours that contribute to habitat degradation and loss, the main challenges facing salmon populations today. As historic and contemporary records illustrate, indigenous peoples of the Pacific Northwest engaged in complex rituals that reflected and contributed to core beliefs related to native animals and plants, and the landscape in which people lived. Traditions and institutions of First Nations peoples and Native Americans incorporated explicit monitoring of resource use and proprietorship, which helped convert open-access resources into common-pool ones. In our modern world, the newly formed rituals and beliefs and local community monitoring efforts that emerge from the much greater public engagement we advocate may not be sufficient to restore salmon populations in themselves, but the past tells us social connections are necessary. We need to continue to support scientific studies, and find ways to improve habitats overall, but in the meantime, also put more resources into activities that promote development of social beliefs and traditions about the value of salmon and their ecosystems to our everyday lives. In other words, if you stop building your environment after 7,500 years, it may collapse. If you treat the web of life as a series of disconnected packages to open, it will unravel. It’s good to see archaeologists reach out and create strong connections to the social and ecological circumstances of today. Their paper is actually one of many non-archaeological papers in a special issue of the peer-reviewed journal Ecology and Society, all the papers in which appear to be downloadable free of charge. Sarah K. Campbell and Virginia L. Butler 2010. Archaeological Evidence for Resilience of Pacific Northwest Salmon Populations and the Socioecological System over the last ~7,500 years. (Synthesis, part of a Special Feature on Pathways to Resilient Salmon Ecosystems) Ecology and Society 15 (1):17. Walk across the river on their backs. This entry was posted in anthropology, Archaeology, Northwest Coast, palaeontology, Uncategorized and tagged anthropology, Archaeology, conservation, First Nations, fishing, Northwest Coast, palaeoenvironment, salmon, zooarchaeology. Bookmark the permalink. I think I might have posted this in another of your blogs, but one reference to ongoing maintenance and distribution of salmon comes from Gilbert Malcom Sproat’s “Scenes and Studies of Savage Life” from 1868, a very early ethnographic work about the Nuu-chah-nulth based on the five years that he lived in Port Alberni (1860-1865). It wouldn’t surprise me if they got the tip-off to this little known bit of Sproatia from this blog, mind you. Incidentally, to anyone, the auto-generated “”possibly related links” includes one dead link to a provocatively titled “First Nations to blame…?”. The real link is http://www.salmonguy.org/?p=156 and is to an interesting blog by a salmon “watchdog” – reading it shows he is not arguing that First Nations caused the decline! His blog makes a lot of good points about salmon health and welfare and also brings a lot of current literature to light in an accessible way. I can’t vouch for the biological underpinnings but it’s a good read. The variety of theories surrounding number of indigenous people pre-contact is a fascinating debate. Seems the dates keep getting pushed further and further back — found Elaine Dewar’s book “Bones” (from a few years ago) a very interesting take on the variety of theories. Also your colleague Morley Eldridge has had some fascinating finds on the Williston Reservoir, north of Mackenzie, BC over the last few years. Also, the research and data coming out of the Fraser River — e.g. Milliken — that suggests some very impressive numbers on salmon consumption pre-contact. As your post mentions — most likely, higher than the present day commercial catch. great stuff. Will link you in over on my site. I remember the buzz I felt 30 years ago when I read Teit’s “Thompson” book, plowing through the many many rituals and superstitions regarding widows and widowers, to paraphrase from memory “that a widower must chew deer fat and spit it on the head of a trout to remove his baneful influence when releasing trout to a lake where there are none. Sometimes the trout become plentiful”. In another place he describes packing trout in wet moss in baskets for such transport. Jenness in the little unpublished ‘Saanich’ ethnography describes people trying to take herring-laden boughs to coves where there was no spawn in hopes the fish would return there. There was clearly an enormous amount of traditional knowledge of how to do such things that the colonists almost totally ignored and would have distained at the time; tiny snippets survive in ethnographies and in continuing knowledge in communities; but I think everyone would agree what remains is a faint glimmer of the knowledge that once sustained people here. Thats not to say that all aboriginal groups had equally environmentally-friendly practices and beliefs. I recall a journal article a couple of years ago describing the belief that every single deer caught in a pound must be killed; if any single one escaped, they would tell their ‘friends’ and the ruse would no longer work. That would seemingly be almost the antithesis of the practice of removing traps and weir sections so salmon could ascend rivers, after an initial harvest. Nice to see such socially-aware archaeology, though, I remember Virginia as a wee PhD student working in Alaska many moons ago! DL, how do the Williston finds relate to salmon? I don’t see the link.